Novel real-time depth acquisition devices, like Microsoft Kinect, allow a very fast and simple acquisition of 3D views. These sensors have been used in many applications but their employment for 3D scanning purposes is a very challenging task due to the limited accuracy and reliability of their data. We proposed a 3D reconstruction pipeline explicitly targeted to the Kinect. The proposed scheme aims at obtaining a reliable reconstruction that is not affected by the limiting issues of these cameras and is at the same time simple and fast in order to allow to use the Kinect sensor as an handheld scanner. A novel algorithm for the extraction of salient points exploiting both depth and color data is firstly proposed. Then the extracted points are then used within a modified version of the ICP algorithm that exploits both geometry and color distances to precisely align the views produced by the Kinect even when the geometry information is not sufficient to constrain the registration. 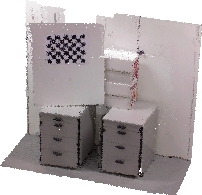 Experimental results show how the proposed approach is able to produce reliable 3D reconstructions from the Kinect data. An improved version of the approach  has been applied to the reconstruction of cultural heritage objects. -------- "Handheld scanning with 3D cameras"
-------- Pula, Italy, October, 2013.